Apple March 25th Streaming Event – Surprise? The Apple March 25th Streaming Event which many believe to be the birth of a long awaited video service. Which will be of a streaming service of some sort. However it may not be the typical Netflix type of subscription video service. But something else entirely different. If rumours are to be believed it may be an enhanced version of the iTunes store and associated Tv app for the iPhone/iPad. The event is said to be more of an update to an already established service than the birth of a new one. The new updated platform will hold all of Apple’s Originals and the iTunes transactional video on demand service (movies, tv shows). Furthermore it will aggregate a broad range of third party tv and OTT video services. So things like HBO and of Showtime. The new service will not be available to non-Apple devices. But Apple is also opening iTunes video content for viewing on non Apple devices via Airplay 2, on third party smart Tv’s. Apple make more money via third party services than it does selling movies and tv shows through iTunes. According to Ovum, iTunes global market share fell from 70% in 2011 to 22% in 2018! Yet it’s share in global retail OTT video revenue share it’s increased from 5% in 2016 to 10% in 2018. It appears like Apple’s aim would be to get people back into iTunes. With the help from their Apple Originals videos. According to Ovum, the Originals service will also be free to Apple device owners, the content may also be already pre installed in the new app! Consequently once people are using iTunes, Apple will encourage users to browse their TVOD service and to sign up for the third party streaming services. Apple will look to take all the best bits from Netflix/Amazon and incorporate them into their service. For example the high end productions from Netflix (Apple Originals) aggregation of third-party services (such as Amazon Prime Channels) and the curation of the TVOD service (Amazon). With Apple’s closed wall ecosystem and a 600million Apple device user base and what you’d expect to be a user friendly interface, Apple may be in a strong position. According to Ovum, hybrid services that the one Apple is rumoured to be launching will take 33% of subscription market share by 2023. 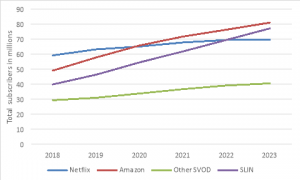 While Netflix’s global market share will stabilise around the 20% mark and Amazon’s will slightly increase to 12%. Apple look to be placing their bets on rather than building a rival to Netflix. To reimagine TV while incorporating the best of Netflix. It seems as though Apple will move into this strategy in to the 2020’s. With a TV world whereby consumers can build their own entertainment package from multiple on-demand services and linear channel services. Plus AVOD where it charges consumers a subscription for access while also carrying advertising. While 2010’s belonged to Netflix and streaming the forthcoming years may look very different. http://wp.freedomofcreation.co.uk/howtokillanhour/wp-content/uploads/sites/65/2019/03/Untitled-1.jpg 820 1660 billywright http://wp.freedomofcreation.co.uk/howtokillanhour/wp-content/uploads/sites/65/2017/09/htkah-web-logo-2017.png billywright2019-03-21 00:00:442019-03-18 21:18:18Apple March 25th Streaming Event - Surprise?